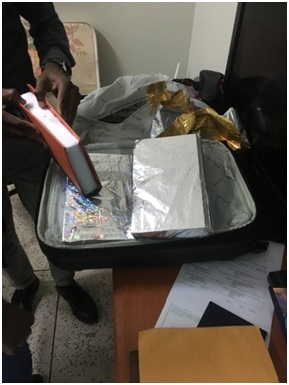 19-year-old Anistecia LaRose, a Canadian resident, was today remanded by Chief Magistrate Ann McLennan for possession of 4.178 kilogrammes of cocaine for the purpose of trafficking. Bail was objected to by police prosecution based on the fact LaRose had no local place of address. Anti-narcotics police at the Cheddi Jagan International Airport, Timehri on tuesday morning arrested LaRose who was on a flight to Toronto, Canada. Four parcels of cocaine was found in her suitcase. The parcels were weighed and the weight determined to be 4.178 kilos. LaRose will return to court on February 13.